Simply, the most stunning house in Granada! A one of a kind 12,000 sq. ft., 4 suites colonial house in the heart of town. Built in the 1840s, the house was given a loving restoration to preserve original architectural details and integrate modern amenities. The house has 2 beautiful courtyard gardens. One has a calming water fountain and the other contains a very inviting pool, to cool off when the afternoons get hot. 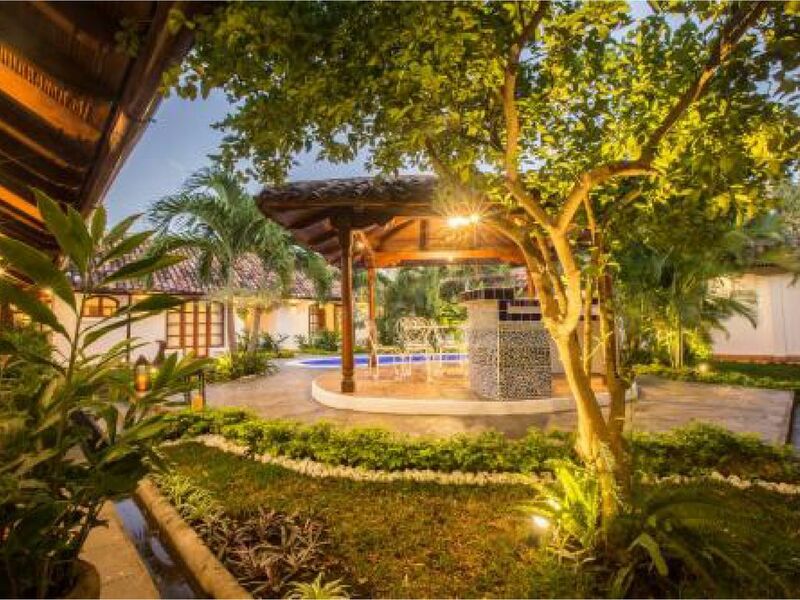 Casa Adela is one of the best located homes in Granada. Situated near Granada's famous “San Francisco Museum” and 2.5 blocks from the renowned Calle la Calzada. The location of the house will provide you with the best of two world. A nice quiet stay and variety of great restaurants, with bars for your entertainment within a 2 minute walk. This home features four suites as follows: the first two located in the center of the home, both with a king size bed, Air conditioning, walk-in closet, private hot shower and a beautiful view of both courtyards. The other two are located at the back of the house, both with a connecting door threw the inside, Air conditioning, walk-in closet, private hot shower and a beautiful view of the refreshing pool. One with two twin beds and the other with a king size bed. The living areas are organized around the extensive corridors and a rancho for when it´s time to enjoy the pool. The main corridor features a beautiful solid wood dining table for ten, with a view to the first courtyard featuring a relaxing water fountain in the middle of a delicate garden and open kitchen. There is another more relaxed seating area situated the opposite end near the pool and rancho. The home has two classic colonial living rooms with majestic doors that open directly into the main street. These two areas are perfect for any activities and get together with family and/or friends, from the simplest to the most elegant ceremonies. The home is well furnished with exquisite furniture and modern appliances. Casa Adela’s common areas invite you to seat and appreciate your stay hence home life inevitably evolves here. One of the mostly enjoyed areas is the rancho next to the pool, that contains a bar for you to have a relaxing stay by the pool. * On Sundays the house opens up to the public to host delicious brunches prepared by a talented chef. Our guests are very welcome to have from the brunch with a special discount. You can ask for our menu. It was a great stay! The place is wonderful, 4 bedrooms each one with a private bathroom, TV, we even had our own pool towels.. Haysell and Ana were there everyday making sure everything was Ok.